There are now four places in Cincinnati to tango! 1569 Chase Avenue, at the intersection with Hamilton, 2nd floor. The Corinthian restaurant, 3253 Jefferson Ave, on Tuesday evening at 7:30. A practica organized by Dave Koucky & Jeanette. In addition to the teachers mentioned below, both Tango del Barrio and Tango Northside will often bring in some of the finest teachers in Argentina for special weekends of classes. Live Music! Cincinnati Tango Jam ensemble. A new group that plays classic Argentine tango music for dancing and rehearsing most Sundays at 1:30pm at Tango Del Barrio! Michael began dancing tango more than twenty years ago. The foundation of his dancing comes from Danel and Maria in New York City. 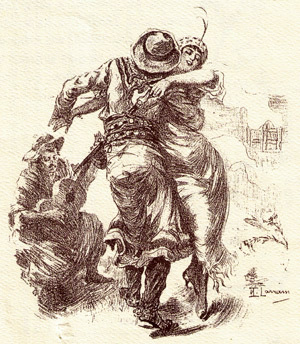 Early in his development he had the good fortune to see and take classes with some of the great show dancers and milongueros from the earlier generation, such as Juan Carlos Copes, Maria Nieves, Pepito Avellaneda, as well as some of the more contemporary dancers, such as Miguel and Osvaldo Zotto, Milena Plebs, and Gustavo Naviera. More off his recent development comes from teachers such as Brigitte Winkler and Tomás Howlin, who are gifted at explaining how the dance works. He taught weekly tango classes for 9 years beginning in Pittsburg, and is proud to have had an important role in getting the dance community started there. He subsequently visited Lexington, getting that tango community started. He has taught in Cincinnati for more than twenty years. Patricia was born in Buenos Aires. She has a degree in Physical Education and Argentinian Dance and Folklore. She has been teaching sports and dance since 1985. From 1987 to 1993, she was a dancer for the Ballet de Arte Folklorico of the Universidad de Buenos Aires. She began her singing career in Buenos Aires in 1995. She has performed in Argentina, Europe and the US. 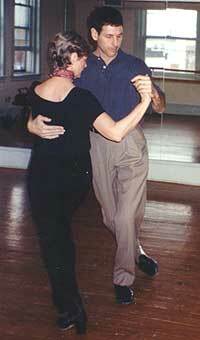 This world famous tango dancer and teacher frequently visits Cincinnati to teach at Tango del Barrio. Virginia discovered the Argentine Tango in 1989 during the performance of Tango Argentino at Riverbend Theatre in Cincinnati. She taught Tango in Lexington as well as the Dayton and Cincinnati areas. She researched the history of the dance and studied with tango masters in New York, Miami, San Francisco, Montreal, and Europe. 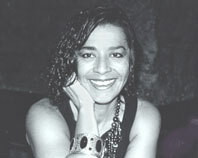 One of her primary interests was to promote a dance community for people who appreciate and enjoy this beautiful dance. Virginia Malton passed away in May of 2011. She will be missed by everyone in the tango community. Dennis Fausz helped found the Cincinnati Argentine Tango Society back in 1989 and was instrumental in its successful development. He was a splendid and encouraging dancer who helped lead the practicas and organized formal workshops. Dennis brought many fine teachers to Cincinnati and hosted them while they were here, including Fabian Salas, Rebecca Shulmann, Michael Walker and Luren Bellucci, and Lorena Ermocida. Dennis was also an accomplished vintage dancer and a member of the Flying Cloud vintage dance troupe. Dennis Jacob Fausz passed away on October 31, 2009 at the age of 60 in Edgewood, Kentucky. Daniel Trenner--native of NYC, now in Florence MA.